Outsized, super-light and skinnied to its bare bones, in the run-up to SIHH 2015, Richemont continue to uphold the extravagant spirit of the previously independent Manufacture Roger Dubuis with the dramatic Roger Dubuis Excalibur Spider Skeleton Flying Tourbillon watch. Even though this piece has been skeletonized to the extreme, if it were it not made almost entirely from titanium it would surely feel unwieldy on the wrist, and at 45mm across as you might imagine it makes quite a statement. Quite simply this is the anatomy of Haute Horlogerie laid bare for all the world to see. Visually it is stunning. A Shuriken star-shape and a Celtic cross combine with spiky toothed components to produce a striking panorama. 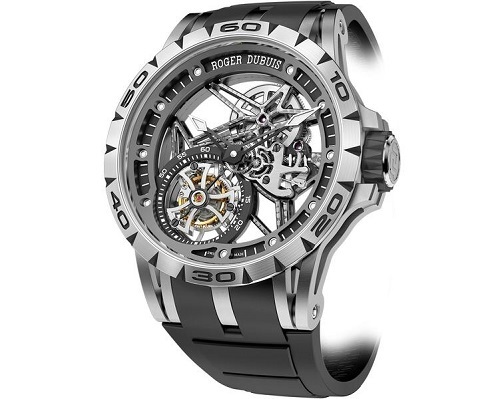 As if to prove their prowess in the genre of skeletonization, the technical team at Roger Dubuis have taken the process further still, carving into the case, flange and of course the hands, so that here too the weight has been reduced and the degree of difficulty has been increased. The notched bezel provides a chunky frame and the titanium screws which serve as hour markers add to the overall masculine, sporty aesthetics of this impressive model. The hand wound RD505SQ calibre features a power reserve of 60 hours and its circular graining and bevel-edged perfection are produced in accordance with the exacting standards of the Geneva Seal and its stamp of approval is a subtle but powerful addition. The Roger Dubuis Excalibur Spider Skeleton Flying Tourbillon forms part of what the brand have termed the "Year of the Skeleton" with an official unveiling to take place during SIHH 2015.